Clinton Darryl "Clint" Mansell (/ˈmænsəl/; born 7 January 1963) is an English musician and composer who was the lead singer of the band Pop Will Eat Itself before embarking on a successful career as a film-score composer. For a decade from their foundation in 1986, Mansell was a member of Pop Will Eat Itself, as a lead vocalist, multi-instrumentalist, producer and writer or co-writer of many of the band's songs. The band were pioneers of sampling and electronic music in the UK alternative rock scene, bringing influences from hip hop, industrial music, house and other dance genres into their music. In the United States, PWEI were signed in 1994 to Nothing Records the label owned by Trent Reznor of Nine Inch Nails. Mansell and Reznor, a long time fan of PWEI, became friends after Mansell moved to New York, and Mansell subsequently performed backing vocals on nine Inch Nails' 1999 album The Fragile. Mansell started composing film soundtracks when director Darren Aronofsky hired him to score his debut film, Pi, in 1996. He also wrote the score for Aronofsky's next film, Requiem for a Dream, which became a cult hit. The film's primary composition "Lux Aeterna" was popular, appearing in adverts, film trailers and YouTube videos labelled as Epic Music. Mansell has composed the music to every subsequent Aronofsky film with the sole exception of mother!. The trailer for The Lord of the Rings: The Two Towers used an orchestral and choral arrangement of "Lux Aeterna",  called "Requiem for a Tower". This orchestration was arranged by Simone Benyacar, Dan Nielsen and Veigar Margeirsson. The original "Lux Aeterna" and "Requiem for a Tower" arrangements have been used in advertisements for the Red Sox–Yankees, Zathura: A Space Adventure, The Da Vinci Code, Sunshine, Babylon A.D. , Lost, Top Gear, Soccer Saturday, EuroSport LIVE, and America's Got Talent. Mansell's theme from the film Moon appears on the trailer for The Iron Lady and the computer game Aliens: Colonial Marines. In February 2019, Mansell signed a publishing deal with Decca Publishing, a division in Decca Music that brought his catalogue of more than 650 original pieces, including his Pop Will Eat Itself work, under a single umbrella for the first time. ^ "Clint Mansell". IMDb. Retrieved 2019-03-11. ^ "Five essential film scores by award-winning composer Clint Mansell | Royal Albert Hall". Royal Albert Hall. Retrieved 2019-03-11. ^ Young, Graham (2016-03-23). 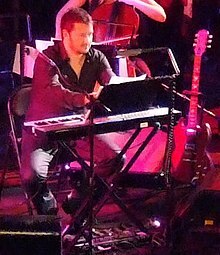 "From dreadlocks to no locks - the amazing transformation of pop star turned Hollywood composer Clint Mansell". birminghammail. Retrieved 2019-03-11. ^ "Decca Publishing signs composer and musician Clint Mansell". Music Business Worldwide. 2019-02-14. Retrieved 2019-03-11. ^ "Pop Will Eat Itself | Biography & History". AllMusic. Retrieved 2019-03-11. ^ Godfrey, Alex. "Clint Mansell: Aronofsky, Reznor and Me, Part One". Sabotage Times. Retrieved 2019-03-11. ^ a b c d "Requiem for a Tower Dream by Various Artists on Apple Music". Retrieved 30 November 2016. ^ "Streama Film - Allt Om Laglig Streaming TV & Film Online". Retrieved 30 November 2016. ^ IGN (27 January 2012). "Exclusive Aliens: Colonial Marines Cinematic Trailer". Retrieved 30 November 2016 – via YouTube.